There is something very powerful about rivers. They have inspired people for thousands of years. 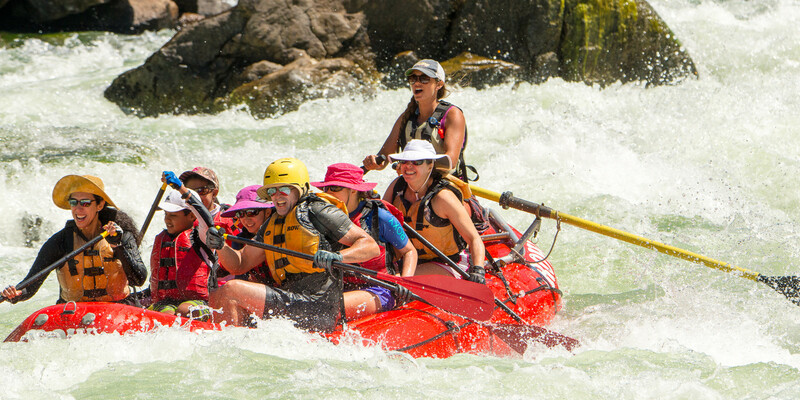 At ROW Adventures, we have witnessed the powerful and natural wonder of rivers for 39 years. We have seen, firsthand, spirits soar, lives transformed and relations flourish when people travel through river canyons. What is it about rivers that makes them so important? So many things, mundane and transcendental. They carry water to the sea; they are the path home for anadromous fish (salmon and steelhead) who in turn bring hundreds of thousands of tons of nutrients from the sea inland that nourish both flora and fauna; they provide water for much of our food; the water for us to drink and to bath; and in many cases they still carry away our pollution. These aspects alone make rivers deserving of our utmost care and protection. Of course, rivers have an indelible spiritual, transcendent quality that ripple through us all in our own way. As conservationist John Muir once famously said, "The rivers flow not past, but through us, thrilling, tingling, vibrating every fiber and cell of the substance of our bodies, making them glide and sing.” Or perhaps writer Herman Hesse says it best in his masterpiece Siddhartha: "They both listened silently to the water, which to them was not just water, but the voice of life, the voice of Being, the voice of perpetual Becoming." Rivers are on every page of American history, and they remain the heart of Americans, the passion of adventurers, the pathways of commerce and the muse of artists. Whatever your inspiration, we invite you to celebrate with us the inspiring accomplishments of the 50th Anniversary of the National Wild and Scenic Rivers Act — working toward its future. This important Act declares that select rivers—or at least parts of them— known for their outstanding scenic, historic, cultural, recreational geologic and wildlife values shall be preserved in their free-flowing condition. Perhaps more importantly, the Act prevents any hydro projects from stopping their flow. The Act recognizes that there is an intrinsic value in free-flowing rivers and that if we failed to protect the few that were left, soon all would be quieted behind dams in the name of progress. The Act was sponsored by Idaho’s own Senator Frank Church and signed into law in 1968 by President Lyndon Johnson who said, "In the past 50 years, we have learned—all too slowly, I think—to prize and protect God's precious gifts. Because we have, our own children and grandchildren will come to know and come to love the great forests and the wild rivers that we have protected and left to them . . . An unspoiled river is a very rare thing in this Nation today." When the Wild and Scenic Rivers Act was signed, there were eight rivers designated. In Idaho, these included the Middle Fork of the Salmon (often considered the “Crown Jewel” of the Wild & Scenic Rivers System) and the Clearwater and its tributaries, the Lochsa and Selway. Also included were the Rogue in Oregon, Eleven Point in Missouri, Feather in California, Rio Grande in Texas, Wolf in Wisconsin and the St. Croix of Minnesota/Wisconsin. As we celebrate the 50th Anniversary of the Wild & Scenic Rivers Act, we celebrate that since the original eight rivers were designated, many more have been added. Today, there are 208 national Wild & Scenic rivers in 40 States and the Commonwealth of Puerto Rico, totaling more than 12,700 miles. While 12,700 miles of protected river may sound impressive, and indeed it is in many ways, this represents a little more than one-quarter of 1% of the nation's rivers. By comparison, more than 75,000 large dams across the country have modified at least 600,000 miles, or about 17%, of American rivers. There are many rivers still deserving of designation that have not yet been protected. Most notably in the American West is the last, unprotected 101 miles of the Salmon River running upstream of Riggins to the confluence with the Snake River in Hells Canyon. Thanks to the Wild & Scenic Rivers Act and its inspiration to continue the work began 50 years ago, there's hope to restore our and rewild our world. We can thank those who came before us and had the foresight to protect free flowing rivers and their adjacent lands. As William Anderson, Tennessee Congressman said while advocating passage of the Wild and Scenic Rivers Act in 1968, "And I count myself more fortunate with each passing season to have recourse to these quiet, tree-strewn, untrimmed acres by the water." We are the ones who today benefit from the wisdom of those who worked so hard to protect wild rivers. We can honor them by continuing to pursue protection for those rivers still deserving of designation – and there are many. You can get involved by joining your local river conservation group and/or the national voice for rivers. ROW Adventures feels both blessed and proud to offer trips on 10 designated Wild & Scenic Rivers including: Idaho’s Middle Fork of the Salmon, Clearwater and its tributaries the Selway and Lochsa, St. Joe, Jarbidge/Bruneau, Owyhee and Snake River in Hells Canyon; Oregon’s Rogue, Grande Ronde and Owyhee; and Montana’s Upper Missouri. In the far northeast corner of Idaho, the Moyie River was nominated and studied, but never designated. In a country where nature has been so lavish and where we have been so spendthrift of indigenous beauty, to set aside a few rivers in their natural state should be considered an obligation. Choosing to save a river is more often an act of passion than of careful calculation. You make the choice because the river has touched your life in an intimate and irreversible way, because you are unwilling to accept its loss. A river is more than an amenity—it is a treasure that offers a necessity of life that must be rationed among those who have the power over it. The song of the river ends not at her banks but in the hearts of those who have loved her.